Coleraine chief Oran Kearney insists motivation will not be required for Friday night’s big derby game against Ballymena United at the Warden Street Showgrounds. The Bannsiders have earned the bragging rights this season, having won the two previous outings against their rivals. Kearney is also determined to get last week’s controversial Irish Cup defeat by Portadown out of his team’s system. “A derby match looks after itself,” said Kearney, who has a full squad to choose from. “They are always feisty affairs and I’m sure this will be no different. “The boys are still hurting after last week’s result. It was the manner on how we lost the game . . . on a dubious penalty award. “We have not had the best of luck in terms of conceding spot kicks lately. We lost out to Crusaders the week before, beaten by two penalties, which were also dodgy. “But the one at Shamrock Park was a major call -- and had a big influence on the result. I spoke with the boys in midweek and told them not to use it as an excuse for the defeat. “To be honest, our performance in the first 45 minutes was as good as I have seen all season. We had five or six good chances to score. We didn’t take them, so we paid the ultimate penalty, so to speak. “I told the boys it was easy to look for an excuse, but we must look within . . . it’s about them and had we taken our chances we would have been out of sight. United chief Glenn Ferguson has Jim Ervin, Tony Kane and Gavin Taggart back from suspension and they’ll be added to the squad. 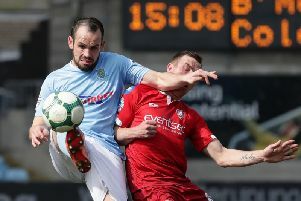 “We are near to having a full squad as Neal Gawley, Michael Ruddy, Willie Faulkner, Matthew Shevlin and Dwayne Nelson are all back from injury,” said Ferguson. Ferguson is still hopeful of squeezing in to the top six in the league table, but is demanding an improved showing on his team last outing - a 4-2 defeat at Ballinamallard United. “Our defending was schoolboy stuff,” he said. “I let them know my feelings and they are now under no illusions of what I expect. It just wasn’t good enough.